The Green-Eyed monster has been the inspiration for our Halloween recipe. Who doesn't love the green-eyed monster! Making these cute monster cookie cups has been a fun activity for our family! PREHEAT oven to 350º F (180º C). Grease 24 mini-muffin cups. Place one square of cookie dough into each cup. BAKE for 15 to 17 minutes or until golden brown. Cool completely in pan on wire rack. With tip of butter knife, remove cookie cups from muffin pan. Arrange on serving platter. Spread the tops of the cookie cups with a mound of vanilla frosting. Spoon 1 tablespoon vanilla frosting into a small resealable bag. Tint the remaining vanilla frosting neon green with the food coloring and place in a microwave-safe measuring cup. Line a cookie sheet with waxed paper. Cut the large marshmallows in half crosswise with scissors. Insert a pretzel stick into the side of each marshmallow to create the eyes. Cut the black licorice laces into forty-eight 2-inch pieces. Place a wire rack over a cookie sheet lined with waxed paper. Heat the neon green frosting in the microwave, stirring every 10 seconds, until the frosting is the consistency of slightly whipped cream, about 25 to 30 seconds total. Holding the frosted cookie cups, dip the cookie cups just up to the rim. Allow the excess frosting to drip off before inverting cookie cups. Transfer to the wire rack to set. Repeat with the remaining cookie cups. If the frosting becomes too thick, return to the microwave and heat for about 5 to 10 seconds longer, stirring well before dipping. Holding the marshmallow eyes by the pretzel end, dip the top half of the marshmallows into the frosting to make the eyelids. Transfer the marshmallows to the waxed paper-lined cookie sheet. While the frosting is still wet, add the black licorice lace along the dipped edge as the eyelid. Repeat with the remaining marshmallows. Snip a small corner from the bag with the vanilla frosting. 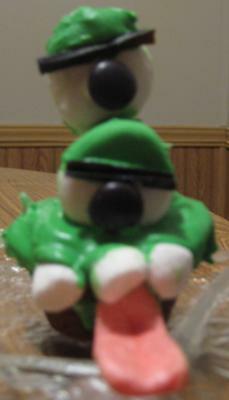 Pipe a dot of frosting on the marshmallow area and add the black M&M as a pupil. Let eyes set for about 30 minutes before assembling cookie cups. Spoon some of the remaining neon green frosting on top of the dipped cookie cups and allow the frosting to drip over the sides. While frosting is still wet, add three to four cut mini marshmallow pieces as the teeth along one edge of the cookie cups. Insert two marshmallow eyes at different heights. Transfer to a serving platter and add the fruit chew tongue under the teeth.